I almost didn't get this post done because I was busy banging my head on the wall. Well done, "Health" Magazine, well done. You've managed to fill a column with a mis-leading piece that (gasp!) could do a lot of people harm. If you're reading this, stand up and then lean way back like you're trying to do a back-bend while still standing. Did you feel your "abs and back muscles" work more? Sure. Standing like this uses them more than not. Is walking this way (in a standing back bend) better for your body? Guess what: using your muscles "more" says nothing about improvements. It's not better that you stood in a back bend just because the measured muscles increased in activity. IT'S NOT BETTER, IT'S JUST MORE. Most young women wear high-heeled shoes daily. High-heeled shoes have a narrow toe box and rigid heel cap; this design often causes an anterior shift of the body weight and an excessive plantar curvature of the forefoot. 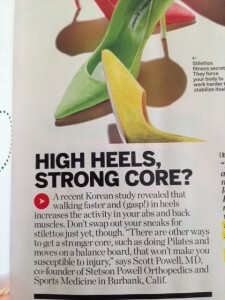 Therefore, high-heeled shoes cause biomechanical damage to the locomotor system. This may result in deterioration in walking (i.e., reduction in the stride length and increased energy cost). Repetitive and prolonged use of high-heeled shoes may be directly associated with increased fatigue of the lower limb and trunk muscles, musculoskeletal discomfort caused by mechanical changes in body structures, and pain in the lower back and legs. and then putting this information through the fitness filter (aka that any extra muscle work must be a good thing because doesn't that mean we burn more calories and build more muscle mass and doesn't that mean that we stay lighter and leaner?). In this case I can see how one would extrapolate that stilettos are a "fitness secret." What we have here is either a case of bad journalism or poor ethics. In either case it is irresponsible. The conclusion of the Korean* study reads: "...increased lumbar lordosis induced by wearing high-heeled shoes requires more muscular effort to control the changing functional demands in the trunk during walking. Hence, muscle fatigue and overload is unavoidable when wearing high-heeled shoes during daily routine activities, leading to musculoskeletal problems in the trunk such as repetitive strain and low back pain." OOPS. You forgot to mention that in your article. And, P.S. your contributing ortho quote doesn't undo what you've done here. This. This is what we're surrounded by. This is the filter through which scientific research is being channeled to you. Start paying attention. 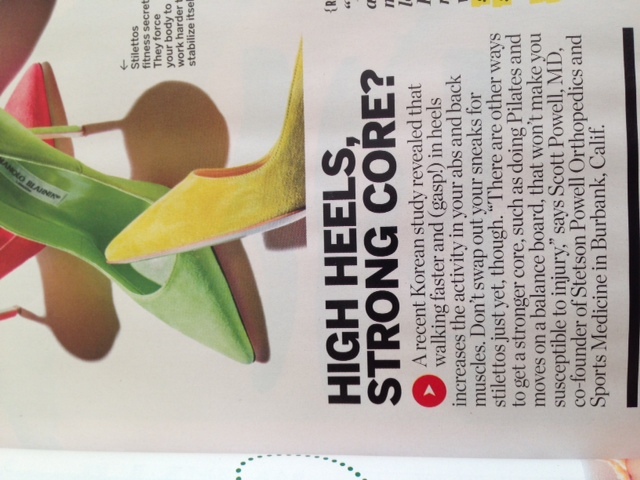 *Dear Health magazine, why is "Korean" the notable attribute for this study? How about "according to a study published in the Journal of Back and Musculoskeletal Rehabilitation?" Or "according to research done by physical therapists?"